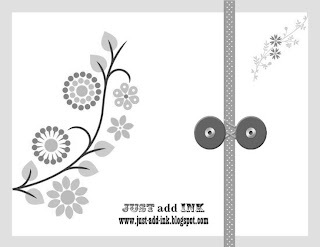 This weeks challenge from Just Add Ink is a: Sketch Challenge. Ink: Pretty in Pink, Certainly Celery, Bashful Blue and Black Staz On. Cardstock: Pretty in Pink, Bashful Blue and Very Vanilla. Accessories: Circle Punches, Blender Pens, Filigree Brads, Hemp Twine and Adhesives. 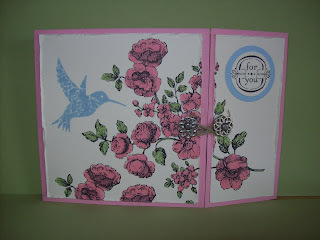 Oh very pretty Sammi, love how the flowers spill over the card and those fabulous filigree brads. Thanks for playing at Just Add Ink.